In refusing to recognize the priestly vocations of women, Sister Joan Chittister said quite accurately that the Roman Catholic Church forces itself to see with one eye, hear with one ear, and walk with one leg. The “constant teaching and tradition” Cardinal Rigali cites came into being because clerical men turned and continue to turn a blind eye and a deaf ear to the voices, the life experiences, and the aspirations of their sisters in Christ. Even now, adult women with full moral agency have been directed by men who sadly, have very little life experience with women, not to speak about the deepest desires of their hearts – to serve the people of God. When women try to speak, they are silenced; their motives questioned. When they act according to the dictates of a well- formed, adult conscience, they are excommunicated. This is in stark contrast to the treatment of the ordained male priests who caused terrible confusion within the Body of Christ by sexually abusing children and vulnerable women. 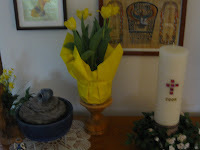 The Pontifical Biblical Commission stated in 1976 that there is no scriptural reason why women should not be ordained. This is based, of course on Galatians 3:28 which states that there is no male or female in Christ Jesus. Paul also wrote of the Deacon Phoebe and the Apostle Junia.. He clearly uses the words “deacon” and “apostle to refer to these women - the same words he used to describe himself. Then, of course, there is the archeological evidence of women priests, deacons, and bishops, which tell their own stories if one has eyes to see and read and understand. Jesus himself believed in the full agency of women when he directed Mary Magdalene rather than Peter to “Go tell!” Mary, then, is the very first person in the New Testament to preach the Good News. Thus, Jesus our Emmanuel, God with us as us, quite obviously did not feel that choosing a woman as the first apostle denigrated Himself, His image, His message or the Kingdom of God..
Jesus, whose companions were the least among us, did not have a vocabulary that included the words “denigrate” or “excommunicate.” Instead, Jesus, the Good Shepherd would seek rather than exclude, enfold rather than cast away. Jesus, the penultimate pastor, never drove people away from His table. He said that we should find rest in Him, not banishment. Excommunication is unscriptural and it is uncharitable. It is unbecoming to those who consider themselves to be pastors. The ordained women who have pledged their lives, their futures and their sacred honor to the Lord God Almighty, Creator of heaven and earth in whose image they were lovingly fashioned, have relied upon that God to guide them every step of the way. They have come this far by faith and hope and love. They will continue to do so as they model a church that sees with two eyes and hears with two ears and walks on two legs. the Easter liturgy in April 2009. 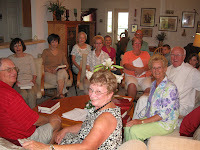 These are photos of a house churchEaster liturgy in Ocala, Florida. Married priest, John O Callaghan and RCWP Candidate for Ordination Dena O Callaghan hosted this beautiful liturgy in their home in Ocala, Florida. On Sunday, April 26, 2009 Mary Ann Schoettly, a resident of Sussex County, New Jersey, was ordained a priest and Chava Redonnet from Rochester, N. Y. was ordained a deacon by Bishop Andrea Johnson. This historic ordination took place in the sanctuary of Mishkan Shalom, a Reconstructionist synagogue in Philadelphia. This is a short video of Philadelphia ordinations. Article in NJ Star Ledger.